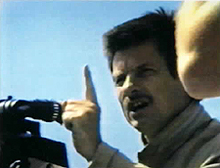 Through film clips, journal entries, and personal musings, ONE DAY IN THE LIFE OF ANDREI ARSENEVICH is renowned French filmmaker Chris Marker's homage to his friend and colleague, Andrei Tarkovsky, who died in 1986. Through close readings of Tarksovsky's films - including rare scenes from his student film (an adaptation of Hemingway's The Killers) and a practically unknown production of Boris Goudonov - Marker attempts to locate Tarkovsky in his work. Parallels drawn by Marker between Tarkovksy's life and films offer an original insight into the reclusive director. Personal anecdotes from Tarkovsky's writings - from his prophetic meeting with Boris Pasternak (author of Dr. Zhivago) to an encounter with the KGB on the streets of Paris (he thought they were coming to kill him) - pepper the film.